The Bestseller: 18.000 copies sold of the German edition alone. From August 2018: finally available in English! Already a hit in the German-speaking countries, the much-cited new book by Niels Pflaeging & Silke Hermann! It contains 33 Complexitools and 22 Complixideas. A fresh start for organizational development and leadership in dynamic times. This book is dense, fun, thought-provoking, counter-intuitive and gorgeous. Paperback. Fully colored, illustrated. 144 pages. New format. Also available in German. The international bestseller - Complexitools´ little sibling. A witty, dense power package of a business book. A nmanifesto for organizational high performance, a thinking aid for contemporary organizational leadership and organization design. The blue and the red - those are two completely different domains.. Because complicated is not the same as complex! In the domain of the complicated, any method often suffices - and complicated problems can be solved with rules, processes, machines and algorythms. In the comain of the complex, however, companies need Complexitools. This book presents 33 of these, as well as 22 crusial complidees - for the thinking that fits with complexity and dynamics. 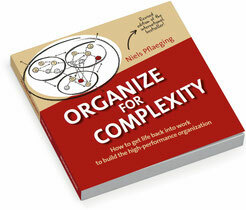 Silke Hermann & Niels Pfläging, authors of Complexitools, show how contemporary organizations can the conceived, built, and developed - independent of size, industry, business models, country, or culture. Complexitools are a smart, and robust approach to organizational development: To revitalize companies and work in an age of dynamics. During the intense, 1-day Complexitools thought clinic, the agile network organizational gains contour: Here, decisions are not made in the center, but in the periphery, where "market pull" leads the way. For more, see Keynotes+Clinics. In the "Making of" section of this website, you find more about the authors. 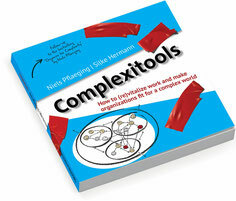 And Complexitools the book also tweets, at @Complexitools! You can also write to Niels and Silke about the book, about workshop or speaking opportunities. A book as lively as today´s markets & today´s work! today´s work, and the challenges organizations are facing today. This book presents smart, contemporary approaches to organizational development and change that are fit for our times and fit for human beings. Beyond blueprints, beyond checklists! More events with Niels to be announced soon!